Babes in Toyland is an American punk rock band formed in Minneapolis, Minnesota in 1987. The band was founded by vocalist and guitarist Kat Bjelland, a native of Oregon, along with drummer Lori Barbero and bassist Michelle Leon, who was later replaced by Maureen Herman in 1992. Babes in Toyland released three studio albums: Spanking Machine (1990), followed by the commercially successful Fontanelle (1992), and Nemesisters (1995), before becoming inactive in 1997 and eventually disbanding in 2001. 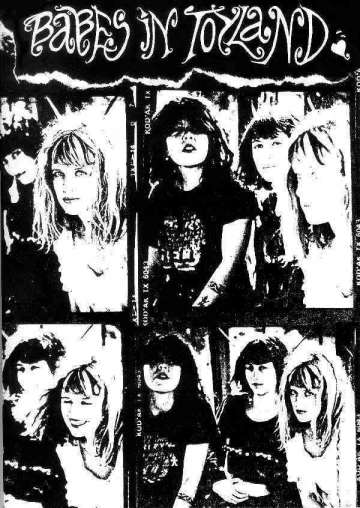 While the band was inspirational to some performers in the riot grrrl movement in the Pacific Northwest, Babes in Toyland never associated themselves with the movement. In 2014, the band reunited, and the following year began performing live together for the first time in over a decade.They completed an international tour throughout 2015, during which bassist Herman was fired and replaced with Clara Salyer.